The works of Geoffrey Chaucer : now newly imprinted / edited by F.S. Ellis. London, Hammersmith : Kelmscott Press, 1896. Printed in black and red with ornamental initials; red print in margins. Colophon reads: Here ends the book of the Works of Geoffrey Chaucer, edited by F.S. Ellis; ornamented with pictures by Sir Edward Burne Jones, and engraved on wood by W.H. Hooper. 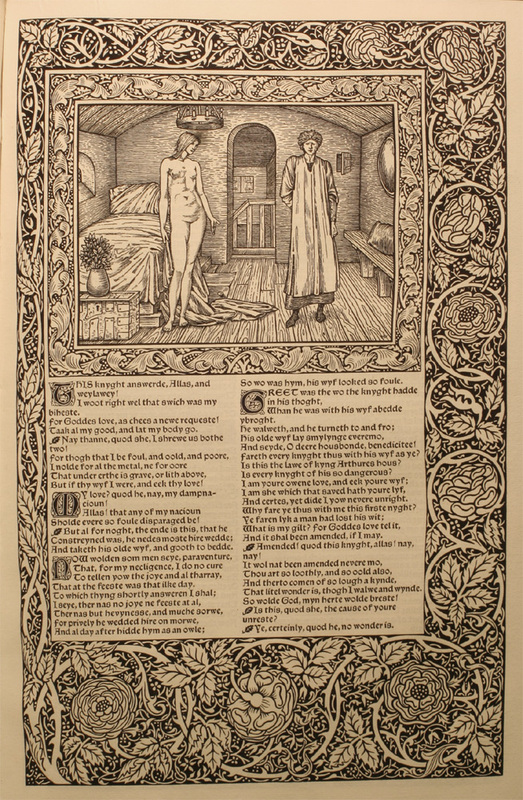 Printed by me William Morris at The Kelmscott Press, Upper Mall, Hammersmith … finished on the 8th day of May 1896. 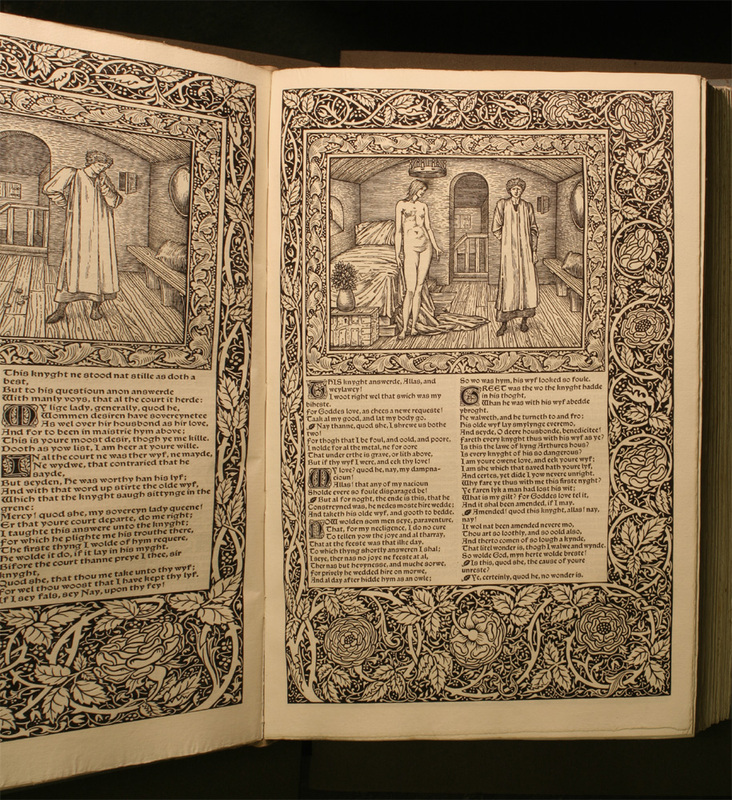 The Kelmscott Chaucer was the crowning glory of William Morris’s career as book designer and typographer. Edward Burne-Jones created the 87 woodcuts that adorn the book, but the font, layout and decorations in themselves are things of great beauty. Burne-Jones referred to it as “a pocket cathedral” – though you would need to have exceptionally large pockets! 425 copies of the book were made in total, and the work took four years to complete. 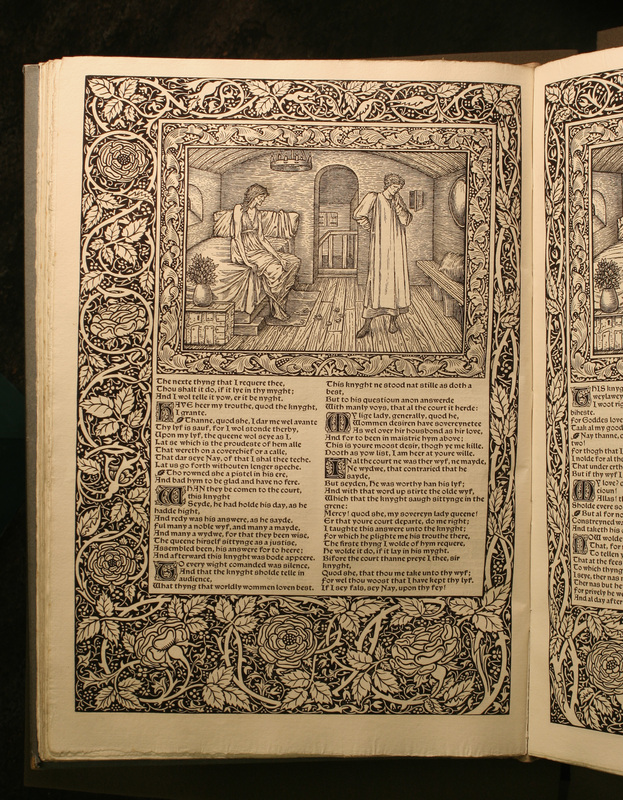 Much has been written about William Morris as book designer, and about the Kelmscott Chaucer in particular.